How to Potty Train - Successfully! - ProudMummy.com the Web's Community for Mums. Home » Blog » How to Potty Train - Successfully! Potty training can be a stressful time. Accidents will happen...to the point that you may well consider buying shares in Vanish carpet spray. Here are some top tips however to make potty training less stress and more success! Talk to your child about what they have done as you change their nappy. 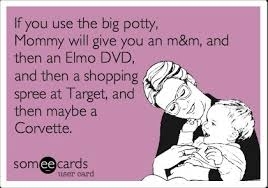 As they get familiar with the terms it will make it easier to refer to each process as they use the potty. At this stage get your potty and put it in position. For most and ideally, this will be in the bathroom, so that it can begin a natural progression to hand washing and eventually toilet training, but it will depend on the size of your bathroom. 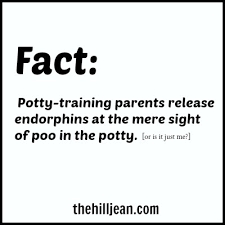 One of the most effective ways to train is to pre -empt accidents by having your child sit on the potty at regular intervals, rather than hoping to rush them onto it when they start hopping around in desperation. If you try to 'panic potty' at the last minute the situation becomes pressured and if they have an accident it feels like a failure. Instead devote sessions where you train. Spend a morning where you take your child to sit on the potty every 15 minutes. Be very casual about it and don't pressure them to perform! If you stick at it every 15 minutes over a couple of hours, chances are they'll catch at least one wee in there...when that happens PRAISE! Make sure you congratulate them on using the potty and verbalise what they have done, "oh look, you've done a wee in the potty, well done!" Let them help with flushing it down the toilet and washing hands, they'll love feeling so grown up. Repeat these sessions as often as possible during the first week, switching between morning and afternoon sessions depending on your schedule. Then after the first week, try to build up to a full day session if possible. You'll soon get a feel for how things are going and if you can extend timings to every half hour and so forth. Gradually build things up until you can just make hourly potty stops or until your child indicates when they need to go. Throughout the training, don't worry if your child has an accident. Remind them to try to use the potty next time but assure them that it doesn't matter. Get a reward system in place for potty success. Whether it's gold stars, a sticker chart or a favourite treat. Who knew that one day you would be so excited that your offspring can poop in a potty that you'd buy bribe them with stickers?! What tips have you found helpful? What has worked for you? Share in our comment section and help out other mums and dads!